A Rancho Santa Fe Sundance Spas hot tub cleaning service client that has a beautiful in-ground hot tub. The Sundance Spas hot tub is recessed into the ground and is surrounded by a natural stone and stained wood exterior. As with all in-ground hot tubs, they should always be built with access to the equipment. The hot tub equipment is located inside of the shell of the Sundance Spas enclosure. When a hot tub repair is necessary, accessing the equipment is necessary or will be costly. Done correctly, this Sundance spa looks great and provides a good sitting area around the hot tub allowing for an entertaining space. 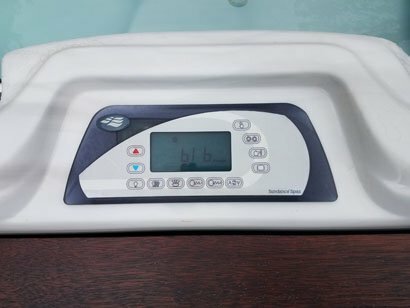 The proper way to clean this Sundance Spas hot tub in Rancho Santa Fe is to first remove the lid and turn on the flow. Next, we test the complete hot tub water chemistry to ensure that we balance the water correctly ever service visit. 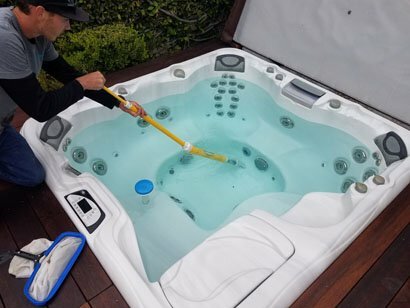 Once we add chemicals to the hot tub, we will use a cleaning solution to clean the Sundance hot tub removing oils, dirt, and debris. As this client does enjoy the Sundance hot tub though it does not get very dirty. So when cleaning, there is usually very little dirt on the floor. Regardless, we always use our Spa Wand and a fine mesh net to ensure all the dirt is removed from the floor and the surface during hot tub service. 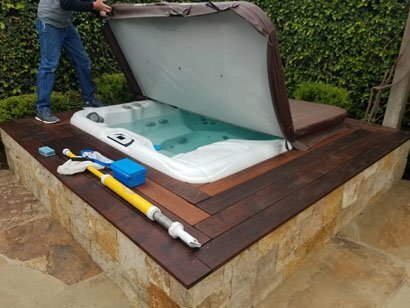 Our Rancho Santa Fe Sundance Spas hot tub service customer likes to know the hot tub is always 100%, we perform a spa drain and clean every few months. When performing a hot tub or spa drain and clean, it entails fully draining, scrubbing, and refreshing with new water. This service is necessary every three to four months though some hot tub service customers like it more frequently. The overall water chemistry is the main reason to drain and clean a hot tub. Specific request by the hot tub customer will also determine how often we drain and clean the hot tub. 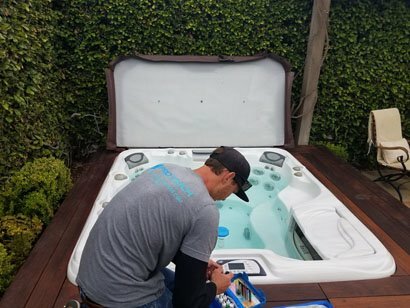 We specialize in hot tub cleaning services and hot tub repair in Rancho Santa Fe and all other areas of San Diego County. If you have a hot tub or spa and need service, we can help.